Most smartwatches sold on the western markets are designed to be smartphone’s companions, and only come with Bluetooth LE connectivity, while we’ve seen many smartwatches (aka watchphones) with SIM card slot originating from China in the past, including the lower end No.1 D3 smartwatch which I reviewed recently. 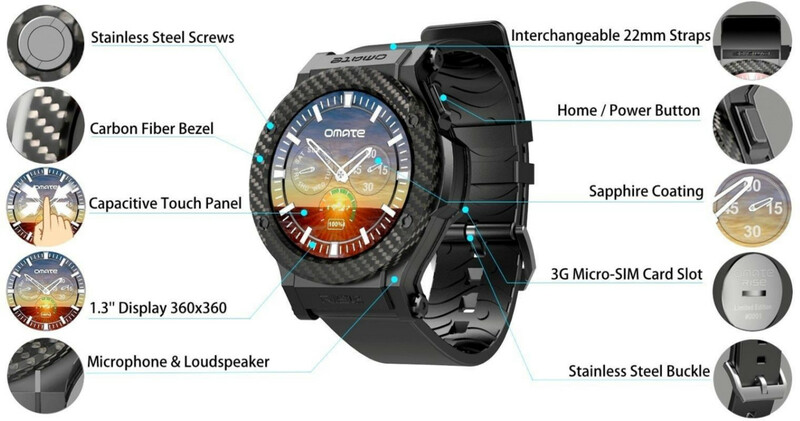 But this may be changing, as Omate is going to launch a new smartwatch called Omate Rise that will include 3G connectivity via a micro SIM card slot, as well as WiFi, Bluetooth Smart, and GPS. The watch will run Android 5.1 with Omate OUI 4.0, and be compatible with Android 4.3+ and iOS 9. It’s interesting to note the processor, memory, storage and display parts of the specifications looks exactly the same as the upcoming Bluboo Xwatch with Android Wear. However, Omate Rise does have some extra features like 3G, WiFi, GPS, upport for the newer Bluetooth 4.1, a larger battery, and likely a better overall quality. The company also plans to release the source code on XDA Developer forums. The watch will be introduced via Indiegogo (not live yet) on December 7, 2015 at 10am (New York time), but unlike other crowdfunding campaign that typical last one to two months, Omate Rise crowdfunding will only take place over 48 hours. A $199 pledge should get you an Omate Rise watch, and for super early bird backers a free BLE heart rate monitor chest belt will be included. Delivery is scheduled for endo f March 2016. At this price it’s in Blocks territory ( which I just pledged for ) and this doesn’t really offer what Blocks does, customizable modules of all sorts. The 3G is Asian bands, not USA. I’m not sure if there will ever be a USA model – has Mediatek settled all of their patent woes in the US yet? Well Asian bands usually means it works in the EU too so while I’m sorry it doesn’t work in USA I’m OK with these things. Blocks will work in the USA btw, they announced a deal with AT&T ( again sorry if you hate AT&T and stuff ).